I've not always been a lover of grapefruit and used to find it way too bitter to appreciate the flavour, but with this delicious freshly squeezed juice recipe that has all changed! Mixing the grapefruit with orange really sweetens it up and makes it so much more drinkable. Whether you're already a fully fledged fan of the fruit, or you just want to incorporate more healthy juices into your life, I def recommend you give this 'mocktail' recipe a go! 2 - Filter the juice - I simply ran the juice through a sieve and into a mixing bowl to remove any excess pulp and leave a perfectly smooth and drinkable concoction! 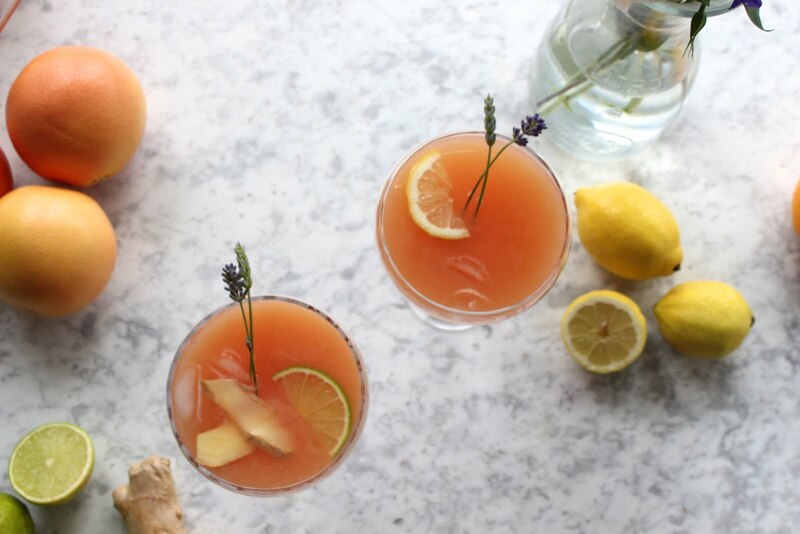 4 - Finish off by pouring into individual glasses, throwing in some ice and garnishing with a couple pieces of lavender and you've got yourself a pretty fancy and vv healthy juice, or the perfect cocktail base!